It’s just a little bit of synchronicity that I picked up this book to read in the same week that I’d read Nathan Hobby’s thoughts about the art of biography when crucial information about the subject is missing. I was looking for something interesting but undemanding to read, and this skinny little paperback that I’d found at the Op Shop seemed to fit the bill. I knew the story, after all, I’d seen the Bruce Beresford film back in the 1980s. 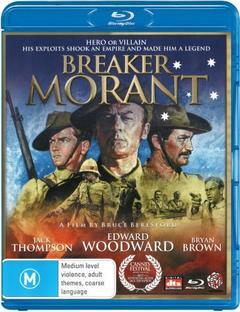 It’s the story of three Australian officers executed for war crimes during the Boer War. It’s a cause célèbre in Australia because there’s a belief that they were scapegoats for the Brits. ‘Breaker’ Morant in particular has become a bit of a folk hero, and once upon a time this book – though not this edition – was a bestseller. I had hoped to write a true history of the events and the people concerned, but the obduracy of the British Government in refusing to release a number of essential documents has made this impossible. Nonetheless, this book has in it many of the historical facts and I’ve departed from history only when the facts weren’t discoverable or when I felt it was necessary in the interest of a good story. Morant, lived, wrote, fought and died pretty much the way I’ve pictured it. I thought I might have a few words to say about the difficulty imposed by the author not signalling which bits were ‘a departure from history’, and about his obvious partisanship in favour of Morant, and I thought I might tease out whether my reservations about the style of it had anything to do with my gender. (There is a tolerance for womanising that borders on tacky admiration). I was considering how I might discuss the narrator’s unnecessary use of racist labels for indigenous people in Australia and in South Africa, when the book was written in 1973 and most of us knew better by then, and the editors at Angus & Robertson should have. And then I scuttled off to Wikipedia to see if I could find out exactly how ‘Australian’ Morant actually was. I was hoping to find out how many years he’d lived in Australia, for Australians to be claiming him as one of their own, when the book starts out, after all, with Morant getting beaten up in a pub because someone took a dislike to his posh Pommy accent. Roxon was put in the position of having to repudiate the idea of a pardon because there had been high level diplomatic activity generated by the 100th anniversary of the executions, which was encouraged by her predecessor as Attorney-General, Robert McClelland. LOL I bet the current crop of politicians might well wring their hands in dismay if the controversy were to be stirred up all over again. So, what to do? Well, I shall confine myself to noting that Part I ‘Australia’ covers Harry Morant’s early years in Australia, written in unabashed admiration for a man who excels in rough-house fighting; womanising with a string of women who (oh, yeah *cynical scowl*) find him so irresistible that they throw themselves at him; and drinking heavily to help himself forget whatever it was that had had him thrown out of the navy and the life of privilege he was born to. In Part 11 ‘South Africa’, Harry volunteers, and we see the familiar tropes of Australian WW1 folklore. Untrained Australian farm boys with initiative and no discipline are superior fighters and strategists to anyone in the British army, who are all snobbish dullards who care only about a soldierly appearance. (My apologies for the offensive simile about Aborigines, but it shows the author’s careless attitude towards them). Part III compounds the impression of that life of privilege when Morant goes ‘home’ to Britain and as a prodigal son fits into upper class life so readily that yet another woman hurls herself at him, bedding him in a way that upper class fiancés, we are most often led to believe, rarely did in the very early 20th century. (And gosh! this one is his best mate’s sister! Imagine what could have happened before the wedding!!) But when Morant hears that the Brits are forming a new unit to tackle the Boer guerrillas in the way that he has advised them to do, why then of course he abandons the fiancé with manful regret to return to a life of adventure. Back in South Africa in Part IV, things get ugly. And this is where the author offers the classic Aussie male justification for unconscionable behaviour: loyalty to a mate. Morant’s mate is Hunt, and Hunt is killed by the Boers. In this book, Morant sees the mutilated body and it incites him to savage vengeance; Wikipedia says otherwise. Who knows? The point is that this version of events doesn’t even raise doubt about it. Nor is there any doubt that the court-martial was a show trial. The reader’s sympathy is enlisted and the court of public opinion makes the intended verdict. The book doesn’t exactly purport to be a biography: Denton is upfront in the foreword about that, but he doesn’t call it historical fiction either. He calls it a book, not a novel, though the publishers do that on the title page. Whatever about that, this book and the way it has spawned new generations of Morant supporters shows how a fictionalised life with claims to authenticity can take on a whole new life of its own. I reckon someone could do an interesting PhD out of the book and the film’s role in the making of a myth. Beresford has expressed dismay about the popular reception of his film. Something else I didn’t know: There was successful legal action against Angus & Robertson because they marketed a 1980 reissue of the book as the basis of the film when in fact it was entirely based on the 1978 stage play Breaker Morant, by Kenneth G. Ross. If anything good comes out of monstrous amount of money spent in commemorating WWI in this country, IMO it ought to be a more mature approach to understanding war. For example, Tom at A Common Reader has just reviewed a French book which looks at a couple of men who react in different ways to their post-war lives and how they were treated, and it also unpacks the profiteering that went on in the haste to memorialise the war in every town and village. I bet that happened here too. The first casualty is truth, and the first victories come to the profiteers. Update 16/1/17 I have removed the link to Tom’s blog because it appears to have been hacked. Fascinating. The space between fact and fiction is endlessly interesting. Even a traditional biographer must, like a photographer, frame scenes and choose material selectively. But this work by Denton seems (to me) clearly fictionalised – itself an interesting word that seems to have emerged from that very space between fact and fiction! And his little spiel at the beginning is not enough to exonerate him (although it seems to have been in enough in 1973). Totally agree with you about the possible PhD topic, what a great idea. LOL Part of the problem is that it’s a thumping good read. He has indeed made a jolly good story out of it! Interesting post, Lisa. I also knew the book (although I don’t think I ever read it) and the film, which I did enjoy, and hearing Kit Denton in radio interviews. I had heard vaguely that there was more to the story. You might enjoy the article cited below which gives a fuller account of Denton’s process and motivation (for better and worse) including his reaction to later findings of evidence against his interpretation in The Breaker. He faced up to this courageously and wrote a book called Closed File to correct his own errors. The article is fascinating and many quotes from Denton paint a picture of a charming, honest, intelligent and passionate writer and TV producer who must have been a terrific role model for his son, Andrew. The article should be accessible through online collections of public libraries and educational institutions. 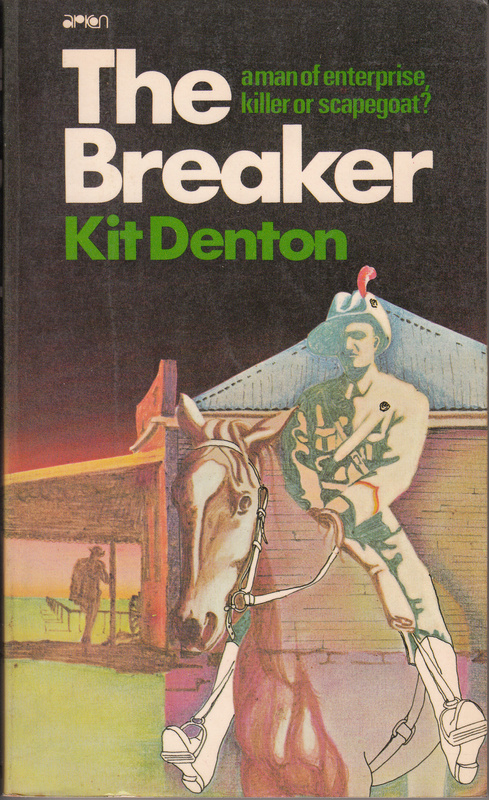 Kelly V. The persistence of myth: Kit Denton and Breaker Morant. JAS: Australia’s Public Intellectual Forum [serial online]. April 2007;(91):123-134. Available from: Australia/New Zealand Reference Centre, Ipswich, MA. Accessed January 4, 2016. Hello Marita, how interesting! Although I was disappointed by the book in terms of its veracity, I’m not surprised that Denton dealt with later evidence honourably because as a reader I could sense his passion for injustice. I’ll try to locate that article but in general I find that accessing those sorts of collections more difficult than it needs to be. LOL the last time I tried I found that the system had somehow uploaded me as an academic and so I received floods of emails about other academics, real ones, that is, uploading their papers. I must have ticked some box incorrectly, I suppose, but I felt like a fraudulent intruder and I very quickly unsubscribed myself! I wondered what you were going to say about such a well known story but your analysis is excellent, made me think again about things that I had only half considered before. Re womanising, you know Morant is said to be the original Mr Daisy Bates. They probably deserved each other. LOL You scandal-monger! Goodness me, almost anything could be said of Morant and it might or might not be true. Bought and read the book in 1988. Awesome and gripping, shed tears when the Breaker was executed. Unfortunately, lost the book and have not been able to find a replacement. Oh! How I love to read it again. Never could lay my hands on the film to watch. Yes, indeed, it is compelling reading, and very well written!